Have you found an income stock that interests you? Here's how to tell if it is worthy of your capital. Many income investors begin and end their dividend stock search by screening for companies with the highest yield. Unfortunately, that can be a recipe for disaster as many of the highest yielding stocks on the market are too risky to touch. That's why investors need to develop a process that helps them weed out bad stock from consideration. With that in mind, here's a look at a few metrics that I like to look at when I'm on the hunt for a high-quality dividend stock. How dependable is the company's revenue? I've learned the hard way just how important it is for a company to have some sense of control over its top line. In the past, I invested in miners, oil producers, and other commodity businesses that offered up seemingly great dividend yields. However, those companies revenues and profits relied heavily on strong commodity prices, which was a variable that was outside of the company's control. When the commodity prices eventually headed south, those companies profits -- and dividends -- evaporated. The recent downturn in energy prices is a shining example of this principle in action. Seemingly safe dividend payers like ConocoPhillips, Anadarko Petroleum, and Devon Energy were all forced to slash their dividend payments in 2016 in order to survive the downturn. The same thing happened in the mining industry last year to investors in Rio Tinto, BHP Billiton, and Anglo American. By contrast, consider a company like FactSet Research Systems (NYSE:FDS). FactSet is a data aggregator that sells financial information to thousands of banks, hedge funds, insurers, and more. FactSet controls how much it charges for its services and regularly pushes through price hikes, which consumers gladly pay because the company's service is so useful. 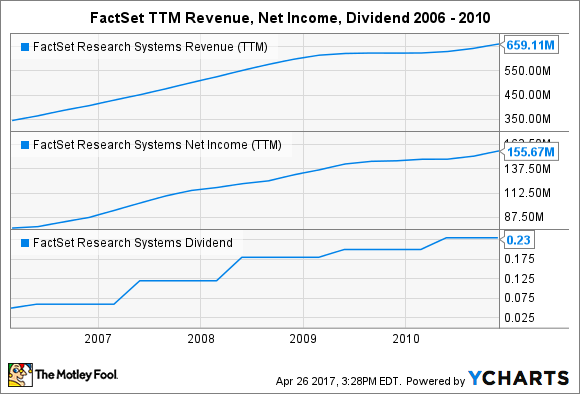 You might think that FactSet's financial statement would have taken a beating in 2008 due to the financial crisis, but have a look for yourself at what happened to this company's revenue, net income, and dividend payment between 2006 and 2010. FactSet's business didn't skip a beat, which speaks volumes about what a quality company it is. To me, this proves that FactSet has a dependable top-line. The next metric I look at for any dividend stock is its payout ratio. This figure is found by dividend a company's dividend payment per share by its earnings per share. In general, investors should start to get nervous once a payout ratio exceeds 90% since it means a company's dividend payment is starting to become unaffordable. For that reason, I've decided to take a pass on toy-making giant Mattel (NASDAQ:MAT). Even though the company's top-line is fairly predictable and it boasts a market-topping yield of 6%, Mattel currently boasts an absurdly high payout ratio of 165%. What's even more troubling is that the company's balance sheet has more than $2.1 billion in debt compared to only $869 million in cash. If profits don't perk up soon then the company might be forced to cut its dividend. By contrast, FactSet offers investors a much smaller dividend yield of just 1.24%, but its payout ratio is a paltry 23%. That means that the company's dividend is much more secure and there is still ample room left for the company to raise its dividend in the future. The best dividend stocks not only sustain their payouts, but they can also grow them over time. You can't do that without a growing stream of profits. That's why I also like to take a look at a company's long-term growth potential before I invest. Consider the diversified utility Public Service Enterprise Group (NYSE:PEG). This company's revenue is extremely predictable and its 3.7% dividend yield appears to be reasonably safe. However, analysts are projecting that the company's profits are going to decline over the next five years as the company's nuclear power facilities struggle. That will likely cap the stock's upside. Once again, this is another area in which FactSet shines. The combination of price increases, organic growth, share repurchases, and potential acquisitions is expected to lead to double-digit growth in the company's bottom-line over the next five years. If FactSet can deliver on those targets then investors should be able to enjoy share price appreciation along with a growing dividend. Given all of the above, perhaps it shouldn't come as much of a surprise to learn that I think that FactSet Research Systems is a terrific dividend stock to consider. The company offers investors a dependable revenue stream, a sustainable payout ratio, and the potential for double-digit profit growth. That makes FactSet a dividend stock that should appeal to nearly any income investor.